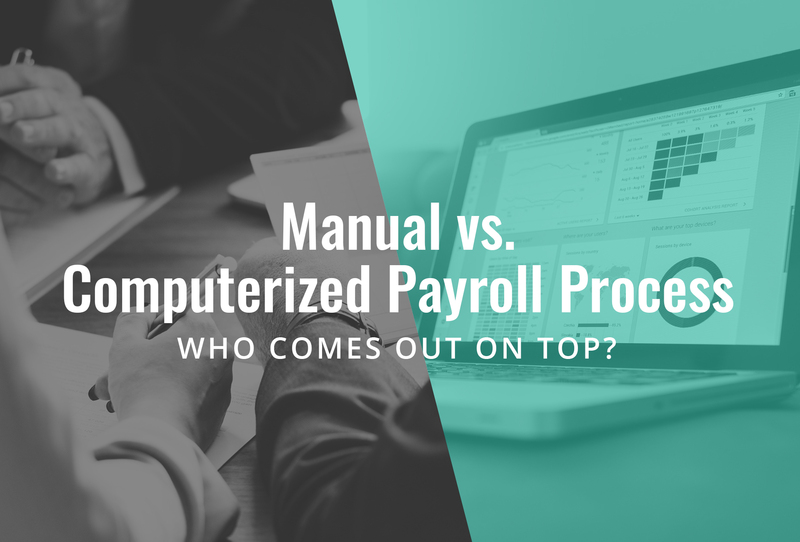 Manual versus Automated Payroll Process, Who Wins? In a man versus machine scenario inside a payroll arena, each contender has their own traits that either gives them the upper hand, or their downfall. Deciding on who beats the other falls on the verdict of the ones who process the payroll, which is swayed by both subjective and objective factors. The in-house processing of payroll of any company is either done manually or using a software. When we say manual payroll processing, we mean that the staff calculates the payroll on their own by manually looking up the right the figures to plugging it into their own formulas. The staff calculate for withholding tax, monitor time and attendance and manually input their data in their Excel sheets and/or papers. Computerized payroll process, on the other hand, is merely inputting the numbers and hitting the right key to run the payroll process in a software. The computerized payroll process automates the manual extraction of the correct numbers to use from contribution tables, holiday pay calculations, and other factors that are required in payroll calculations. Pitted against each other, many would lean towards the favor of the machines. Though this might be true in some cases, the victor is not always clear, especially when it comes to subjectivity comes into play. When it comes to which process is faster, computerized payroll process dominates round 1 with a clean knockdown. Given that the payroll software was properly set up with a competent administrator running it, the computerized payroll process is likely to be faster even if competing against a seasoned payroll accountant. Enterprise-grade payroll systems are built for speed. Administrators simply need to plug in the correct numbers and click the right buttons, and in a minute or less, payslips are generated with matching government reports that are ready to be submitted. In terms of learning curve, computerized payroll process is still generally faster. Reliable payroll software is designed to be intuitive, which makes each step of the process easy to be completed with a minimal margin of error. For round 1, the battle of speed goes to the payroll system. Regardless of which methodology used to process the payroll, the victor goes to whoever hits the bullseye mark each time, meaning that the figures need to add up or be accurate for each payroll run. In this scenario, who wins this round goes to whichever meets the right circumstances. For the manual payroll process to dominate this round, the payroll accountant needs to bring his/her “A” game. The most obvious possible defect in going manual is the human factor, which is likely to incur errors in retrieving the wrong data, using outdated contribution schedules, and so on. Payroll system prides themselves on calculating the figures correctly for each payroll run. However, this is only true if the payroll administrators used the software properly, and if the updates are configured correctly before the payroll run. Much like the manual processing, the human factor needs to be spot on. For round 2, the battle of accuracy is a draw. The idea behind having a cost-effective payroll system is that it actually helps the company save money, resources, and time. Many would say that the winner of this round has to go to manual payroll processing since many associate “manual” to mean less cost, but that is not always the case. The startup cost for manual processing is minimal. The expenses usually involve the employee overhead and resources like paper, calculators, internet connectivity, PC/laptop, and perhaps an abacus, depending on how archaic the payroll process is in the company. For payroll software, the startup cost is usually the employee overhead plus resources like laptop/PC and the license to use the software. When comparing the initial costs for each process, going manual is likely to be cheaper of the two, but only in the short term. Manual payroll process overtakes the overall cost for using payroll software in the long run, and it catches up through the accumulative cost of the resources used and the long hours spent in processing the payroll. For round 3, the battle of expenses goes to computerized payroll processing. Trust is a subjective factor that depends entirely on the individuals. With that said, deciding who takes this round is not so easy to determine due to human nature is not consistent with all. Seasoned veterans who have been doing their payroll manually have a tendency to look down on computerized payroll processing, usually indicating that it not any better than the hands-on approach for it automates key steps in the payroll process. Fans and practitioners of computerized payroll process would easily point out that their payroll software has in-depth security features and flawless algorithms that make each payroll run secure and accurate, making it more trustworthy. For round 4, the battle of trust is subjective, making it a draw. Not factoring in the possible employee record tampering before they are tucked inside closed doors or encrypted databases, this round is about how vulnerable the records are from unauthorized individuals after they have been filed in their respective storage points. The victor for this round depends on the security measures taken. Though one might think that payroll software is more vulnerable due to computer hackers, it does not fair any better than an intruder breaking into the office and tampering with employee records. Surveillance cameras, strict protocols, guards with integrity, and a good lock are just as secure as databases that are encrypted with advanced technology. The factor that tips the scale is all about how easy it is to catch the perpetrator once there are signs of the security being compromised. Catching the guilty individual depends on how on top the management is when it comes to monitoring employee records. For manual payroll process, management needs to tediously sort through paper trails and scrutinize each document to reduce their risk factors. For payroll software, it’s as simple as looking through the computer records on the changes in the records and questioning who changed it last. For this round, the battle for security goes to computerized payroll processing. The one who picks up the pieces faster to continue tasks after a disaster wins this round. Understandably that there are different types of disaster with their own damage range. For argument sake, this round uses a disaster that compromises the tools they use to process payroll. With the given scenario mentioned above, manual payroll processing would require less time to get backtrack. Their tools like calculators, paper, and references are easier to replace and faster to get started. For payroll software, getting the license, replacing and setting the computers/laptops up requires more time and approval. However, if the company is using a cloud-based payroll software, the actual time to get back up is less, though the part that takes up the most time is getting new laptops/PCs. For this round, the battle of business continuity goes to manual payroll processing. In this battle between processing payroll manually and processing it in an automated manner, this fight goes to the decision cards. Despite that the round 1, 3, and 5 are clearly won by payroll software, the other rounds (with the exception of round 6), could still sway either way to make the decision a draw or in the favor of the payroll software. When it comes to processing payroll, it doesn’t have to be complicated… After all, it’s JustPayroll.